In this post we will see how to connect a DHT11 or DHT22 Temperature and Humidity sensor and configure RPi-Monitor to present and draw the outputs. This article will also explain another capability of RPi-Monitor 2.x: the dual-axis. 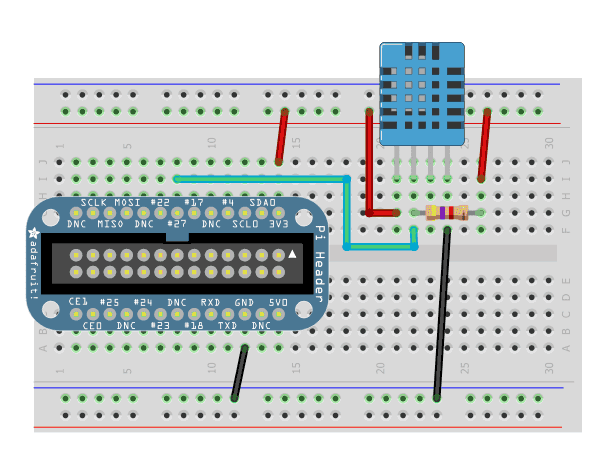 Adafruit created a very good tutorial explaining how to use DHT11 or DHT22 . This tutorial is available at this address: http://learn.adafruit.com/dht-humidity-sensing-on-raspberry-pi-with-gdocs-logging/wiring. Thanks to Adafruit ( again ;-) ) the installation is quite simple and can be done with two command lines. You should see the information about temperature and humidity displayed as shown upper. Note: The DHT11 and DHT22 sensors will only respond every second so if you are not getting data, be sure to wait few seconds before trying again. Warning: Be sure to use Linux linefeed format with line ending with LF (and not CR/LF like in Windows). 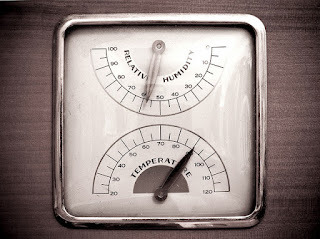 Let's now use this information and add humidity graphs on existing temperature graph. As the unit are different than the one existing on the initial axis, we will add a second axis for the percentage of humidity. This is the purpose of the two last lines of the configuration bellow. The first line is defining the usage of axis number 2 for the humidity. The last line is defining how this graph should be drawn: On the right, starting from 0 up to 100. I am using Rpi-monitor for use radiooaficionado Raspberry with. But I am unable to join in a plot temp and hum with the DHT22. Adafruit command if I read well the values, but I can not do well because the temp change I always get 0. The first thing is to check if the command from Adafruit is working. I guess you checked that. Be sure th install this command in /usr/bin to ensure it is in the path. To configure rpimonitor, you should ensure that the dynamic Id (15 and 16 in your example) are immédialtely followin the last number already existing in the configuration file. The same comment goes to the Id of web.satsistics.1.content. You don't need to pose process the result. You can let the temperature axis be defined automatically (remove y1axis). You can refer to github to see how I did customize my installation. The expected result is a valid number (integer or real). Note: $1 can be replaced by the porsprocessing formula. Once you are sure the value is extracted correctly, you can check if the configuration made is not going in conflict with other definition. In fact there is a double space after the = sign in Adafruit_DHT's output. Putting two spaces between = and (\S+) works fine in my custom config, without the additional space it was returning 0.0. Your code is playing with my rasp, and DHT 22. I am also using DHT11 with adafruit code, and I found a possible bug. In the file Adafruit_DHT.c, line 94, the while loop waits for the gpio pin to rise. However, if for some reason this does not happens, the program hangs. So I added a counter (named safety) to wait maximum 1 millisec. If no answer comes, the function returns with error code 2. Humidty is ok but not temp. Adafruit_DHT 2302 4 write right temp and hum. Did you check the regular expression? I would advise to read the comments I mase upper, you will certainly find interresting tips helping you to find the solution. Adafruit_DHT 22 4 command working ok. Where is error ? Did you check the regular expression as proposed in my previous answer? (Ref comment of September 10, 2013 at 11:34 AM) ... I guess no :-(. Then, your regular expression for tempetature is wrong. Remove the tailing $ and check the RegExp with the command line described upper. Once your regular expression will work, then add it into the configuration file. first thanks very much for your nice and valuable monitor!! I added the DHT11 to my RPI and found, thst every 2nd or 3rd measurement goes to zero, and so there are gaps in the graph. I think this is due to much to short delays between triggering of the readout program. My question is, how to stretch the delay between the measurements? The delay is configurable. There is a parameter to set into /etc/rpimonitord.conf. I let you read the comment in this file to find the parameter to update. I really appreciate you making this tool available. Thank you. I am having trouble with a DHT22 and version 2.5.1. When I run on 2.4 version 2.4 I get nice clean graph. After updating to 2.5.1 I get a very noisey graph with lots of 0 values. I think its because the DHT22 gives lots of unknown data readings and because the two versions of RPi-Monitor treat unknown data differently. "Update rrd graph with unkown data if fetched information is not a valid number"
means in the 2.5.1 release notes? RPi-Monitor is designed to graph the data extracted. In previous version the behavior of the graph was not reliable since sometime no data were stored in the RRD. Now, it stored the data extracted or unknow, there is no more hole in the RRD. You are experiencing a side effect now and it let me wonder if your previous graph was correct or not... Not sure that the timeline was correct. 1/Create a script which is getting the info from the sensor and updating a file when the data is correct. 2/Configure Rpi-Monitor to read the information in this file. Like this, if your sensor doesn't send information, the data stored in RRD will be the same as the previous one. 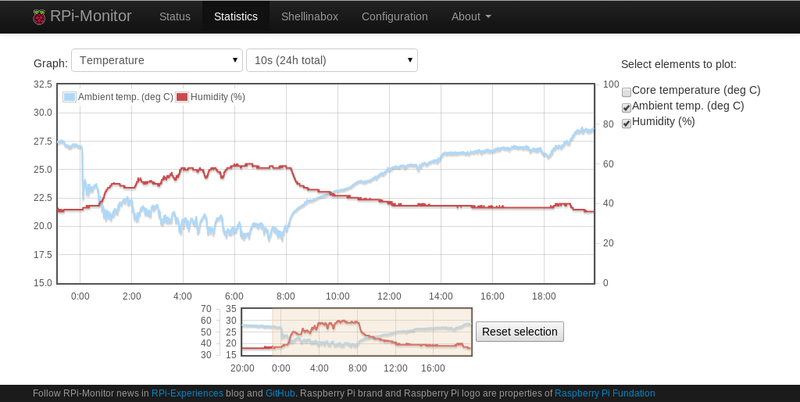 Can you help me to add both temperature and humidity data from DHT22 to RPi-monitor? first I would like to thank you for this great tool! It took me a bit of tinkering but now I got it (mostly) to show what I want. There is one thing that I would like to correct: I am reading information from a remote sensor into a file. Among other I read the voltage of the battery in form of a number like 115. Then I calculate the voltage 115*0.02+1 (3.3V) this value is stored in the database. This prevents it from auto-scaling the y-axis. This is a great tool, thanks for pulling it together. The DHT22 has an issue where it returns bad data if you query it too often. To work around that, I've created a script that queries the sensor once for temperature and humidity and then appends it to a file. The script is executed by cron on a periodic basis. Collection and graphing seem to be working as I expect, but I'm curious as to what method rpimonitor uses to read a file. Can you shed some light on this? Does rpimonitor read all lines and aggregate the data, or does it just read the last? I didn't design rpimonitor to read more than one postprocess line and I don't know how it will behave if more than one. Thank you for your RPI monitor, its awesome, but something is not working for me. Everything worked perfectly, thanks Xavier. Do I need to chmod Adafruit_DHT? On the basis of all of the above I was able to do so. Everything works. Already tried with sudo and the result is the same. "bcm2835_init: Unable to open /dev/mem: Permission denied"
What is the problem with sampling? It's common for an undefined value. I have DHT11. You will now find the answer into the FAQ page. Try to record the temperature and humidity readings in a file with check writing the correct value, and then add the file to the chart. first of all, thank for sharing your work with us. I am not a programmer just a computer enthusiast. I am trying to do something...easy I think but due to lack of knowledge I stuck. I want to graph 3 sources on the same graph (I have a BMP085 sensor connected to a Pi), Temp, Hum and Pressure. The problem is the value of the barometric pressure which is hundred of times higher that the temperature and humidity and can't be represented on the same axis without jeopardizing the other two. I want to transfer the Pressure values on the left vertical axis of the graph table but...I don't know how! I have tried several things but no luck. Could you please help me ? RPi-Monitor is fully configurable. Each configuration is different and have his specificity. It is not possible to provide a configuration for each situation. Nevertheless, to reach you objective, I would advise you to read carefully this article and try to reproduce what is described here sharply. Once this will work, you will have enough knowledge to update and customize your configuration file to your wishes. Thanks again and keep up good work. File stat/null.rrd is not a valid RRD archive! When I read your comment, I thought "Where this 'graph.3' is coming from?" and I finally realized that it comes from the text of this post. This mistake certainly come from the spell check I made recently. The post is fixed. You should just change "graph.3" by "name" and it should work. Hey thanks for your answer. At last, just did it! There is no more leaky DHT11 graph! :) I was a little modified the python script. in your configuration, 'cat' is not needed. By default, RPi-Monitor read the content of a file given as source. Removing 'cat' will reduce the load of your system (a little bit...). Such a script has been requested many time. Can you share the final version of your script (dropbox link)? I'll add it into the script directory and provide it with the future release of RPi-Monitor. Forked version of it on GitHub. :) The original version created by Adafruit. Thanks to Sancho and all the people participating! I have just set up the logging using the script that Sancho posted about 2 weeks ago. It is called every minute (cron job modified for use with DHT22). There is just one problem left that I cannot work out: the graph displayed has a not the correct scaling. For humidity and temperature it should be 0 to 100 (for both) but on the left side of the graph I only get a scale from 0 to 60 (humidity)! The right side displays 0 to 100 properly. What is wrong about this config? Another question is how are negative temperatures treated / is negative scale allowed? The Sensor is mounted outside the house and will pick up negatiev temps of course. One strange thing on your configuration is that you add both axis on the "right". I don't know how rrdFlot is behaving in such a situation. For the temperature, I would advise to not define axis and let the graph generator manage it. If you really want to define your axis, I think negative value is allowed for min parameter. 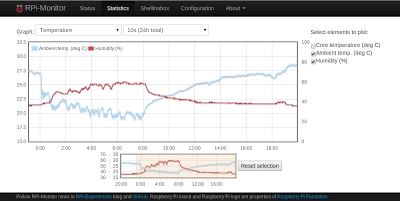 The strange thing is that y2axis (temperature) behaves exactly as configured (while the config format is identical)! It rather seems to be a problem when using multiple axis. If possible I would like to avoid autoscaling both axis and set them manually. I have installed rpimonitor to a raspberry pi in order to monitor two sensors. A DHT22 and a BMP085. Every time I have to restart Pi for some reason, the rpimonitor stops reading the sensors and create graphs. I have to manually stop and start the service in order to get readings and graphs again. This is happening only with those two sensors. The rest graphs works after Pi restart. Any advice ? I would bet you did enter the command to extract data whitout the full path. For example 'gettemp.sh' instead of /usr/bin/gettemp.sh'. you were 100% right. That was the problem. I entered the full command path and now it works. Thanks for your prompt reply. Keep the good work up! I am very much looking forward to having this functional but have seemed to come to an impasse that surely can be accredited to my novice skill level with the Pi. after which I appeared to have communication but still no results produced. Data (0) 0x0 0x0 0x0 0x0 0x0"
Any suggestions as to how I could proceed from here? Secondly, you can have a look the the FAQ of RPi-Monitor's blog, you may find interresting tips. RPi-Monitor is just using the data given by this application (as it does from others). Once will work, I would advise to use RPi-Monitor Interactive (rpimonitor -i) to setup your configuration file. I use a DTH11 and alternatively DTH22 sensor. Why is the measurement series so sketchy. and what I do not understand why I have to ask twice for the sensor temperature and humidity? I was very sad about instability of DHT11 sensor and made some tricky soft update. Anyway I've used fraglord2000 script modified to also store a time,temp,humidy log in var/log. Also, donation sent, thanks for this awesome piece of software!